Stock photo of the City of Toronto's skyline with the CN Tower and Rogers Centre all lit up and reflecting onto Lake Ontario taken near nightfall. 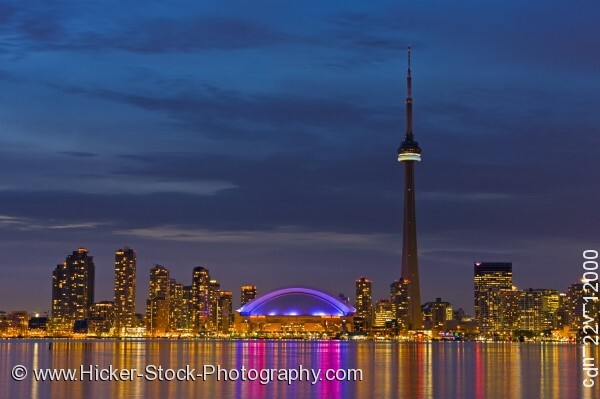 This stock photo includes the skyline of Toronto with the CN Tower and Rogers Centre at dusk, over Lake Ontario, City of Toronto, Ontario, Canada. streaks of light from the buildings above shine down onto he water in this panoramic scene of Toronto's skyline. A large portion of sky is included in this view and is only barely blue with lots of clouds turned dark in the absence of sunlight. is located in Southern Ontario on the northwestern shore of Lake Ontario. With over 2.5 million residents, it is the fifth most populous municipality in North America. Toronto is at the heart of the Greater Toronto Area (GTA), and is part of a densely populated region in Southern Ontario known as the Golden Horseshoe, which is home to 8.1 million residents and has approximately 25% of Canada's population.